Exciting debut winner Divine Image spearheads a four-strong Godolphin challenge for the Listed UAE 1,000 Guineas on week five of the Dubai World Cup Carnival at Meydan, UAE, on Thursday, 31 January. 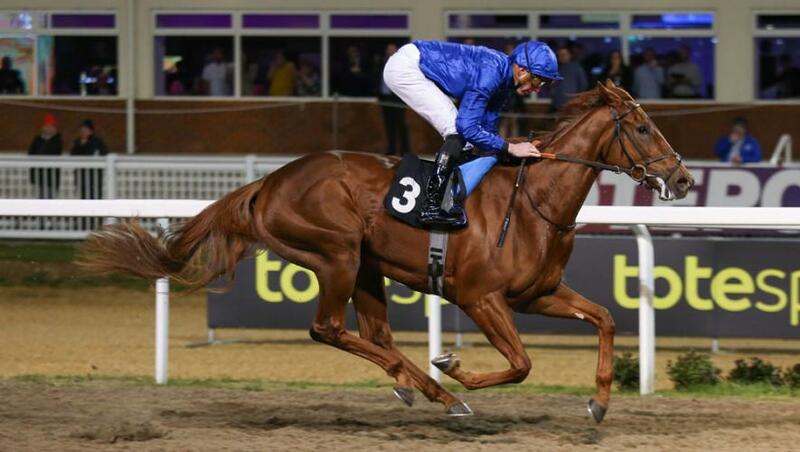 Divine Image (Charlie Appleby/William Buick, drawn seven of the 16 runners) remains over a mile for the dirt Classic for three-year-old fillies after storming to a very easy and impressive six-length success in a Polytrack novices’ race at Chelmsford City, UK, in December. She is joined by Lover’s Knot (Charlie Appleby/James Doyle, drawn five), who makes her first appearance since winning gamely by a neck in a six-furlong turf contest at Newmarket in July. Saeed bin Suroor is doubly-represented too in the UAE 1,000 Guineas, with Tapeta scorer Swift Rose (Kevin Stott, drawn 13) and G1 Prix Marcel Boussac seventh Dubai Beauty (Christophe Soumillon, drawn two) lining up for the Godolphin trainer. Both make their second appearances of this year’s Carnival, having finished a never nearer fifth and 14th respectively in the seven-furlong UAE 1,000 Guineas Trial on Thursday, 3 January. Charlie Appleby commented: “Divine Image was impressive at Chelmsford City on her debut, when she did everything the right way round. “This will be her first start on dirt and we are mindful that a potential lack of experience could count against her, but she showed a good level of ability on her only start. “Stepping up to the extended nine furlongs of the UAE Oaks (Thursday, 21 February) has always been our main aim and she will improve when she goes up in distance. “Lover’s Knot won at Newmarket in July and was just slightly weak as a two-year-old, so we decided to give her time to develop rather than run her in Group races at the end of the UK season. Saeed bin Suroor said: “Both Dubai Beauty and Swift Rose were disappointing in the trial for this contest, but came out of the race in good order. Nashirah (Charlie Appleby/Brett Doyle, drawn seven) finished runner-up in the UAE 1,000 Guineas Trial and the Dubawi filly switches back to turf for the seven-furlong Meydan Classic Trial – a race that also features the Saeed bin Suroor-trained pair of Burj (Kevin Stott, drawn six) and Magic Image (Hayley Turner, drawn 11), another Dubawi filly. Godolphin is well-represented in Thursday’s handicaps, with last year’s G3 UAE 2,000 Guineas winner Gold Town (Charlie Appleby/William Buick, drawn seven), by Street Cry, dropping down in class to be top-weight in the mile contest on dirt after keeping on to take fourth over the same course and distance in the G2 Al Maktoum Challenge R1 on Thursday, 10 January. Fly At Dawn (Charlie Appleby/James Doyle, drawn five), successful on dirt at the 2017 Carnival, goes in the same race along with the lightly-raced duo of Big Challenge (Harry Bentley, drawn six), racing on dirt for the first time, and Laeith (Chris Hayes, drawn 12), a son of Dubawi, who are both trained by Saeed bin Suroor. G3 Singspiel Stakes fourth Team Talk (Christophe Soumillon), a son of Teofilo, leads six Godolphin contenders for the10-furlong turf handicap, with his trainer Saeed bin Suroor also responsible for Silent Attack (Kevin Stott), who was a staying-on third in a mile handicap at Meydan on week two of the Carnival. Newmarket handicap victor Oasis Charm (William Buick), French G3 winner Stage Magic (Colm O’Donoghue), Listed scorer Key Victory (James Doyle), another son of Teofilo, and Zaman (Brett Doyle), successful in the 2017 Listed Meydan Classic, all represent Charlie Appleby in the same race. Both of Godolphin’s principal trainers send out two runners in the concluding mile turf handicap, with Iffaaj colt Major Partnership (Christophe Soumillon, drawn two) and Bedouin’s Story (Oisin Murphy, drawn 12), by Farhh, looking to build on recent Carnival performances for Saeed bin Suroor. Charlie Appleby has On The Warpath (William Buick, drawn 16), runner-up over the course and distance in a handicap on Thursday, 17 January, and the long-absent Aqabah (James Doyle, drawn 11), who makes his first start in more than 15 months. Completion (Charlie Appleby) is a reserve in the same race.